Large attractive map of San Francisco. Thomas Bros. Map of The City and County of San Francisco. 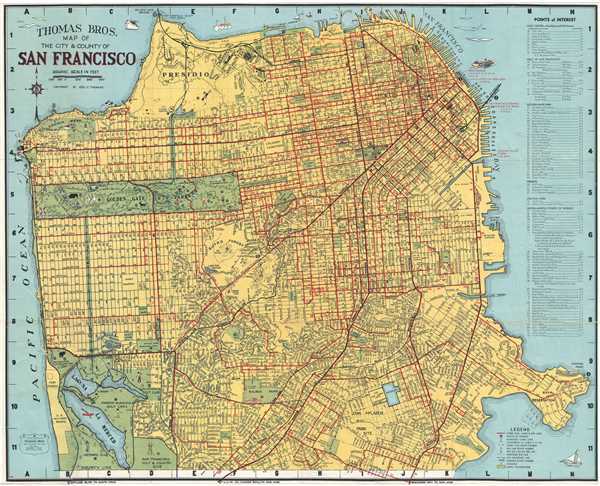 This is a fine 1945 pocket map or plan of the city of San Francisco by Thomas Bros. It covers San Francisco City from Lake Merced in the south to the Golden Gate Bridge in the north and from Great Highway in the west to Hunters Point in the east. It notes all major streets, piers, parks, cemeteries, railroads, etc. A street index is included on the right hand side of the map proper. The whole is surrounded by illustrations of ferry boats, sail boats, ships, seals, mermaids, etc. Accompanied by 60 page info guide containing a street index, transportation lines, hotels, points of interests and additional smaller maps. This map was copyrighted by Geo. C. Thomas and published by Thomas Bros. Very good. Minor wear along original fold lines. Professionally flattened and backed with archival tissue. Accompanied by 60 page info guide.